1 [caption]: My hobby: Manipulating the Dow Jones Index to get revenge on ex-girlfriends via geohashing. 2 Me (stick figure): 5 seconds... 2,381 shares of Microsoft... SELL! 3 Me (stick figure): Yes! This will teach her to dump me for that guy with the ball pit in his apartment! 4 Internet Nerd 2: The GPS says the point is 5 metres that way! 4 Internet Nerd 1: ...use your bathroom? 4 Internet Nerd 3: Live long and prosper! 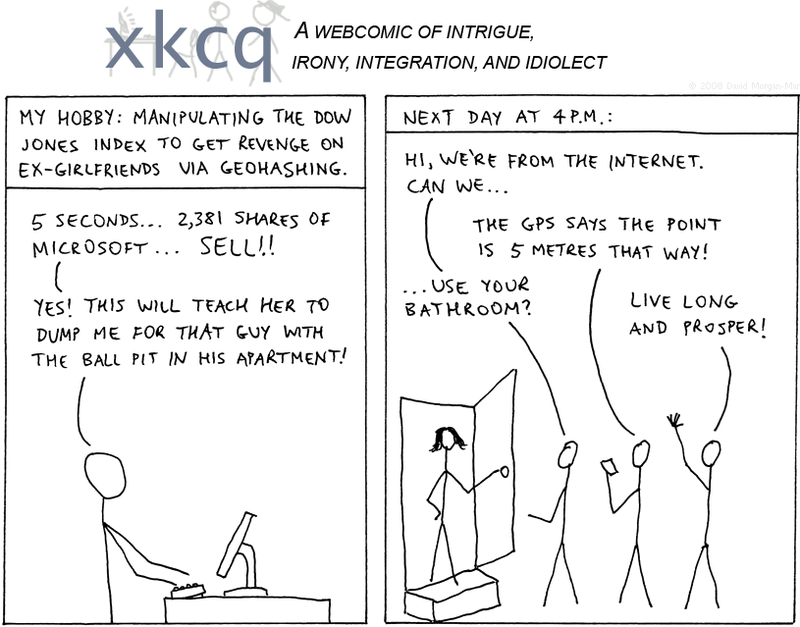 Geohashing is an activity invented by Randall Munroe, author of the webcomic xkcd. The concept was first published in xkcd strip 426. Basically, you take a date, and the most recent Dow Jones Index opening value, concatenate them as strings (with a dash in between), then use that string to generate pseudo-random latitude and longitude coordinates by applying the MD5 hashing function. The geohashing algorithm generates a point on the Earth within each square bordered by integer latitude and longitude lines (known as a graticule). So wherever you are, there is a geohash point within a few hundred kilometres - a new and different point each day, effectively random, and - because of the use of the most recent Dow Jones value - unknown until shortly before the actual date. So, with approximately 24 hours notice, the idea is to go to your local geohash point at a pre-determined time (4pm being the canonical time), use a GPS receiver to locate it to within a few metres, and hang out and have fun with all the other geohashers who have shown up at the same point at the same time. It's actually an incredibly cool idea, and a geohashing community has grown up around it, with more or less regular meet-ups in various random locations around the world. So if you are ever accosted by a bunch of Internet nerds wielding GPS units, you'll know what's going on. Someone has been deliberately manipulating the US stock market just to get at you. Last Modified: Sunday, 14 September 2008; 03:11:02 PST.